Having a heater or heating system that blows cold air is a common problem. However, if you don’t take the right steps right away, this might cause you to incur heavy replacement costs. So the first time you feel a blast of cold air from your heater, here are a few things which need your attention. Sometimes, these issues are easy to fix and you can resolve them on your own. At other times, you may need the assistance of a professional HVAC service to restore the proper functionality of your heater. The most frequent reason heaters malfunction can be a faulty thermostat. The thermostat is a major component of any heating system and where major HVAC issues begin. Take a look at the thermostat and set it to ‘auto’ instead of ‘on’. When you keep your thermostat to ‘on’ mode, it constantly runs its fan to blow out air, even when your furnace is not actually heating. Another possible reason for getting cold air out of your heater could have to do with the pilot light. Chances are that the pilot light is out. The pilot light is the small flame that lights when you turn on the heater. Sometimes you just need to re-light the pilot light in order to fix the problem. Also, the gas valve of your heater may be shut off if you are using a gas heater. Also, make sure that you are receiving gas at full pressure in your home. You can do this by checking your gas-powered oven or stove. In the case of the electric furnace, check the connections and make sure that you are receiving adequate power. Clogged air filters are another reason you could be experiencing cold air from your heater. A restricted or limited air flow can cause your heater to overheat. As a safety precaution, this overheating shuts off your heater’s burners. This safety control is installed to prevent damage to your furnace. So inspect the air filters and clean them to allow proper air flow, cleaning them every month, and replacing them every three months. Speaking of which, not every heating system issue can be fixed as a DIY project. Therefore, don’t hesitate in taking the assistance of a professional, nor should you simply overlook the issue altogether. 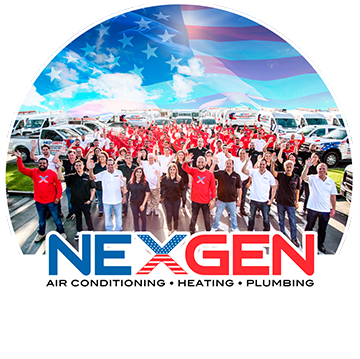 Nexgen Air can find the solution to your HVAC problem and repair or replace your unit. We serve clients across Southern California, from Ventura to San Clemente: give us a call today to set up an appointment at 833-3NEXGEN. © Nexgen Air Conditioning Heating and Plumbing | ALL RIGHTS RESERVED.